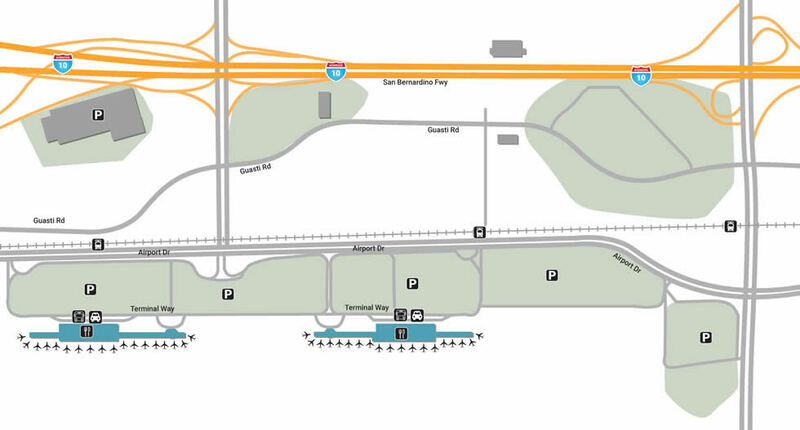 Use our maps when you are needing to get to area hotels quickly and need to get around the Ontario International Airport quickly. Located 35 miles south of downtown L.A., Ontario is a mountainous city that brings a unique light rarely seen in the sunny state. Ontario International Airport is the shining portal that brings people from all over the world, offering only 2 miles of distance between you and a metropolis that’s waiting to show guests a different side of the West Coast. For hourly parking, choose form either Lot 2 (located on West Way) or Lot 4 (located on East way), both of which are opposite their corresponding terminal numbers. Lot 3 is located in the middle, offering the lowest daily rate throughout the facility. If you’re driving an electric car, utilize either Parking Lots 2 or 4 for a free charge-up. If you’re planning to enjoy a long trip, head to Parking Lot 5 for the lowest daily rate as well as free shuttles that get you home. If you have any questions, visit the airport parking office, open 24-hours a day. With a medium-sized spread, the facility offers a ton of services that are not only easy to get to, but more pleasant than you’d think. Enjoy up to four complimentary hours of Wi-Fi at one of the many square desks located outside every gate. The airport is especially welcoming to mothers, who can feed their young at either the Women’s Room (Gate 207) or the Family Restroom (Gate 407). Relieve your pet at one of the two Pet Relief Areas located on the west ends of both Terminal 2 and 4. Let them reciprocate by enjoying the good vibes through the airport’s PAWS program, designed to help relieve the stress of passengers. There are two main areas you can spend your time shopping; terminal 2 or terminal 4. If you find yourself restless and pre-occupied, distract yourself with an interesting read at Author’s Bookstore in Terminal 2. While you’re there, pick up some cheer at California & Co, a gift shop that offers bare essentials in the form of a unique convenient store. Occupy your time even more enjoying the shops closer to Terminal 4, breezing past the headlines of News Connection or picking up some cool tech-cessories from Tech-E.
Make sure you treat your body right by exploring the local eateries and specialty foods, whether it be the Mexican at El Paseo Cafe & Bar, located in Terminal 2’s food court, or the airy pizza at Schlotzsky's Deli next-door. Terminal 4’s food court is home to double the choices, offering fresh morning Joe at Coffee Bean & Tea Leaf as well as quick & simple snacks from Route 66. The only fast-food option available throughout the facility is Carl’s Jr, located in the Terminal 4 court.